Removes all oil filters from 2-1/2 inch to 3-1/8 inch in diameter. This extra large range enables this wrench to fit most of all import car filters plus the common 3 inch domestic car filters. Steel jaws grip filter without slipping. Works in tight spots from the front of the filter using 3/8 inch drive. 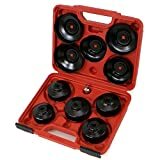 Lisle wide range filter wrench fits filters from 3 1/8″ to 3 7/8″. The steel jaws grips the filter without slipping and it works great in tight spots since it works from the top of the filter. For filters up to 4-1/2 inches in diameter, choose the TEKTON 12 in. Oil Filter Pliers. The three-position slip joint design quickly and easily adjusts to size. For a sure grip on slippery, oil-covered filters, large teeth are set at a right angle so that they bite in either direction. Long handles with soft, nonslip grips offer extra reach and leverage in tight places to go where band-style wrenches can’t. Most traditional oil filter wrenches require a lot of side clearance to operate which in some applications is limited. To make things worse, many times manufacturers don’t put oil filters in the most convenient locations. The Motivx Tools universal oil filter wrench can be used to remove a filter when it can only be accessed from the end, eliminating the need for side access. When used with a long extension your hands don’t need to be anywhere near the oil filter. With it’s 2.5″ – 3.25″ adjustment range this single tool can be used with a wide range of cars, trucks, motorcycles, ATV’s, and more, including the hard to reach Polaris Ranger oil filter. -We start with a 3/8″ thick solid steel top plate that won’t bend or break. This MX2330 oil filter wrench is specifically designed to remove spin-on canister style oil filters with an outside diameter of 2.5″ – 3.25″. It cannot be used for filter installation and isn’t for use on chrome plated filters or cartridge style filters with a reusable housing. 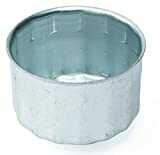 For reference we have included a list of Fram Extra Guard oil filters below that are compatible with this oil filter wrench. KDT2790 Features: -Specially designed wrench removes and installs hard – to – reach 3-Inch (76mm) oil filters with a 15 – flute end.-It fits various flute designs found on AC/Delco, Farm, Wax, STP, NAPA, Sears, Grad, VW, Motor craft and other filters.-Use with a 3/8-Inch square drive tool or a 1-Inch wrench.-Durable steel wrench is zinc plated to resist rust.-Be sure fluted end of filter matches wrench Caution – wear eye protection. Do not use with power tools. 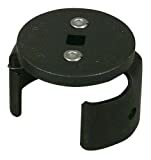 .-3-Inch-Inch End Cap Oil Filter Wrench. Warranty: -Lifetime warranty does not cover abuse..
FloTool, by Hopkins Manufacturing, offers the most comprehensive and highest quality offering of fluid handling products. Driven by innovative, no-mess product solutions, whether you’re changing your oil, topping off the antifreeze, or checking all your automotive fluid levels, FloTool has the right application. Designed to capture oil easily with less mess, FloTool’s 15-Quart Oil Drain is the perfect tool to eliminate spills and messes while changing the oil on your vehicle. 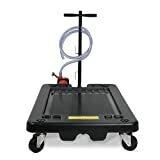 The 15-quart drain container has a substantial capacity that works well for oil changes on both large and small vehicles. Made in the USA. Your search for the perfect oil filter wrench is over. 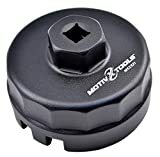 This Motivx Tools oil filter wrench is THE BEST oil filter wrench you can buy for your Toyota. It offers the best fit, the best finish, and the best overall quality to last the life of your vehicle. 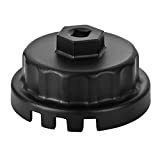 This oil filter wrench is a perfect fit on all 2.0L to 5.7L in Toyota, Lexus, and Scion vehicles that use Toyota oil filter 04152-YZZA1, 04152-YZZA4, and 04152-YZZA5 including the new 2GRFKS 3.5L Tacoma and 8AR-FTS 2.0L in the NX200t and RC200t. It does not fit the 1.8L engine or vehicles that use disposable spin-on style oil filters. TOPNEW Oil Filter Wrench for Your Toyota, Lexus, and Scion Vehicle. Why Choose TOPNEW Oil Filter Wrench Cup ? 1)We only use high quality 6061 T5 aluminum to construct our wrenches, they are forged into shape under extreme pressure resulting in a very durable tool and it offers the best fit and finish, will last the life of your vehicle. 2) Our Toyota oil filter wrenches are finished with a special black anodized finish in gunmetal, making this wrench rust and corrosion resistant. 3) The 14-flute 64.5mm design follows OEM specifications, and is a perfect fit to remove oil filters and cartridge style filter system, and prevents stripping of the housing cap. 4) Most Toyota oil filter wrenches, while similar in appearance, are made of cast aluminum. Casting aluminum is much less expensive than forging but the result is a significantly weaker tool prone to cracking and failure. 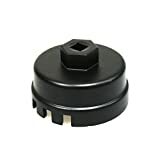 This oil filter wrench is a perfect fit on all 2.0L to 5.7L in Toyota Camry V6, FJ, Highlander, RAV4, Land Cruiser, Sequoia, Sienna, Tacoma (2016 only), Tundra, Venza; Lexus ES, GS, IS, LS, LX, NX, RC, RX. At TOPNEW, we believe in our products. So we offer offer 18-month warranty and friendly customer service, easy-to-reach support. Our Toyota oil filter wrenches are designed for maximum torque, made from premium quality forged alloy to last long. 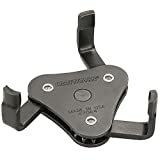 With sand blasted non-slip finish for better use, this allows you to wrench Toyota oil filter caps safely and easily. Non-slip design, safer and easier to use. 64mm cartridge style oil filter housing caps with 14 flutes. BETOOLL is well-known as a leader in providing quality auto parts to the aftermarket. BETOOLL has earned the reputation for excellence from over five years of experience in providing automotive replacement parts primarily for the automotive aftermarket. The prestigious position stems from a unique combination of application expertise, innovative product design, and breadth of product offerings, many of which are not conveniently or economically available elsewhere. 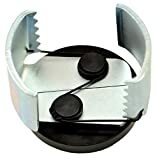 The universal oil filter wrench set adjusts when the handle is turned. 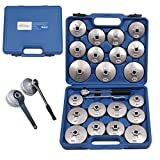 Includes (1) standard oil filter wrench (adjustable from 3 7/16 – 3 3/4 inches) and (1) Small oil filter wrench (adjustable from 2 3/4 – 3 1/4 inches). The wrenches are 7 1/2 inches in total length and features a 6 1/2 inch handle. This is a must have tool tool for do it yourself oil changes, auto mechanics, repair and lube shops. If this oil filter wrench does not meet your expectations, we will replace it or refund you 100%! Suitable For Installing; Removing; And Tightening Objects of Any Shape. The Channellock 209 9-Inch oil filter/pvc plier has a jaw capacity of 1-3/4 to 3-1/2 In. 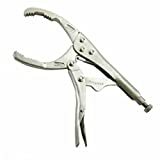 This plier removes stubborn oil filters from cars, trucks, motorcycles, ATVs and lawn and garden equipment. Will cover just about any need.